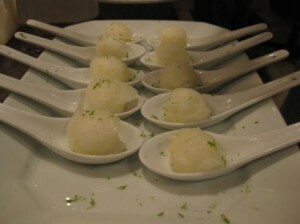 There’s nothing like a good sorbet to cleanse the pallet between courses. 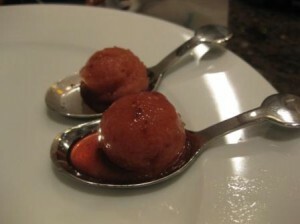 These two sorbets were part of our ten course New American Tasting Menu we did the day after Thanksgiving. I have made this Lemon Basil sorbet before. It is one of Emeril’s recipes and back in the summer I traded the lemon for fresh watermelon and that also made a delicious sorbet. I had never had a port fig sorbet before but I had a bottle of port and some fresh figs so I thought, why not. 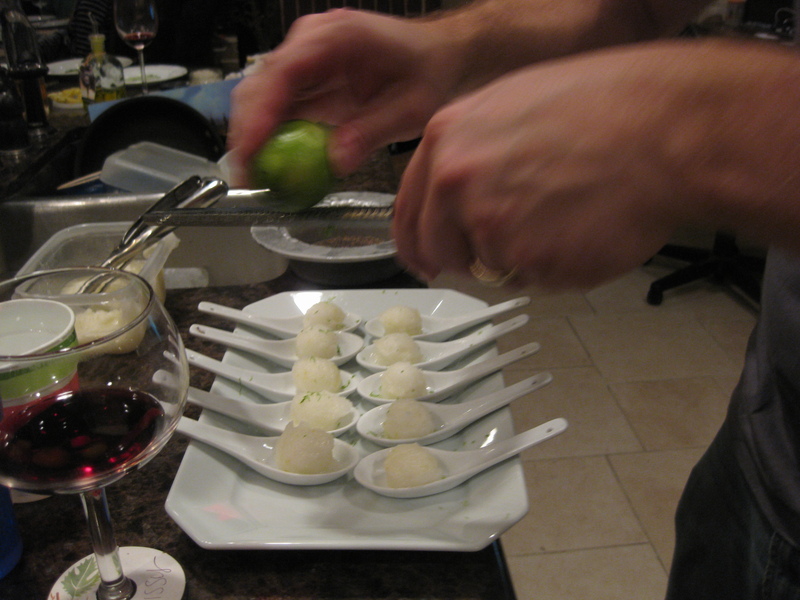 My daughter in law made the Port and Fig sorbet and I made the Lemon Basil sorbet to use as palate cleansers between some of our courses. Lemon Basil Sorbet getting a little lime zest. In a small saucepan, combine the water, sugar, lemon zest, and lemon juice. Bring to a simmer and cook until the sugar is dissolved, about 10 minutes. Add the basil and mint and set aside to steep for 3 minutes. Strain syrup through a fine mesh sieve and set aside to cool. Transfer to the refrigerator until thoroughly chilled, then process in an ice cream machine according to manufacturer’s directions. Transfer to freezer-proof container with a lid and freeze until ready to serve. See Watermelon Sorbet. 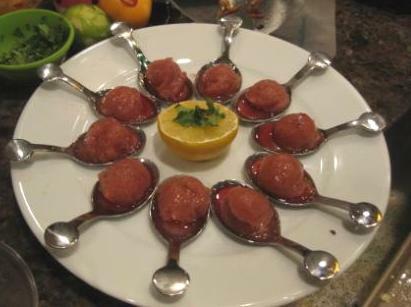 Remove the stems and hard bits from the figs and cut into quarters. Add figs, 1/4 cup water, and Meyer lemon zest to a sauce pan. As the mix is heated, add the zest of the Meyer lemon juice. Cook covered for 10 minutes or until the figs have softened and begin to break apart. Stir two or three times during the 10 minutes. Stir in sugar and cook uncovered until the figs begin to thicken and become syrupy (about 2-3 minutes). Remove from heat. Using a food processor or stick blender, puree the fig mixture. Remember, it’s HOT so use extreme caution. To the puree, add the 1 1/2 cups water, port, and juice of the Meyer lemon. I opted to user Meyer lemon as it’s fragrant but not overly acidic. I didn’t want the sorbet to be too tangy. Once the mix is cool, pour into an ice-cream mixer and mix according to your mixer’s directions. I let it run for about 25 minutes and it was semi-firm. Pour into a container and freeze until ready to serve.